Navy blue 'barathea-style' blazer or casual jacket. Similar to the one that I used to wear for school all them years ago with flapped pockets rather than patch pockets. This is a must see-must have! It's in good used condition. 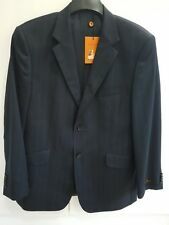 The jacket is navy with fine vertical stripes ( see photographs ). approx 79.5cms from collar to hemline at back. Fabric is 100& WOOL. A bit criss. Simon Carter, London, tailored wool grey slim fit 38" chest mod blazer. Mint condition. Worn about 3-4 times, and kept in a suit bag, on a hanger. With original sales recipes, tags etc. From a professional, pet and smoker free home. 99p start and no reserve.